"One of the finest heritage hotels in Mandawa, Rajasthan, Hotel Shekhawati, is a popular accommodation facility for tourists. 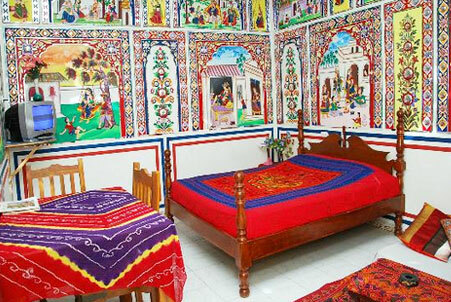 This 100-year old Haweli is well-laid out with traditional and authentic Rajasthani Frescoes that existed over a century ago. 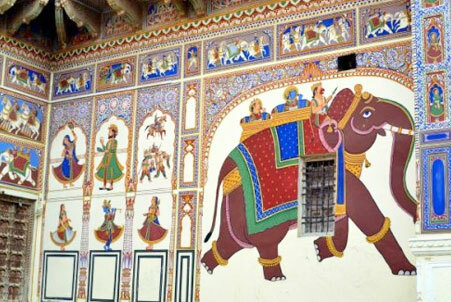 Major attraction in this hotel for guests is the open air Gallery of Rajasthan. 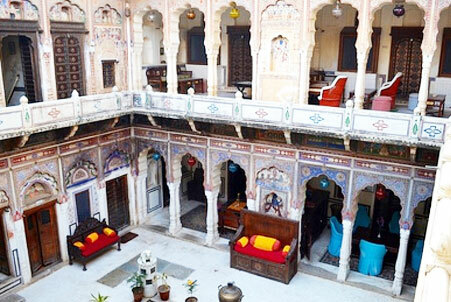 The 2-star Heritage Hotel in Rajasthan, Hotel Shekhawati is a building which was built over 100 years ago. It one acted as the entertainment house for music and dance performances by the Royal Musician Families, built by erstwhile Rulers of Mandawa. Now, existing as an appealing heritage hotel, the original frescoes, paintings and ornaments of the previous century can still be found in the hotel. 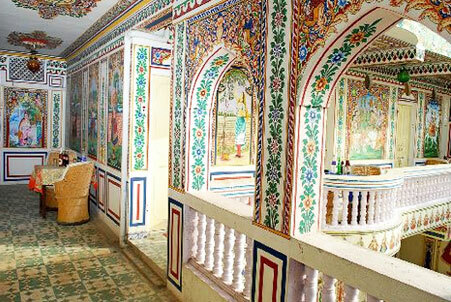 All the 25 rooms at Hotel Shekhawati serves guest with elegant interior, luxurious furnishing sand modern amenities. The warm staff of the hotel elates the guests who stay in their rooms with their round the clock services and traditional sense of hospitality. The rooms are designed according to European style of architecture and oozes out a sense of Royalty. The multi-cuisine restaurant namely, The Dining Room, in the hotel elates the guests with traditional Rajasthani food along with other exotic Indian and international cuisines. The rooftop restaurant has unique stylistic surroundings and offers a well- spread view of the numerous Wells, Castle, Havelies and Temples nearby. The town of Mandawa is located in Jhunjhunu district of the Indian Desert state, Rajasthan. The town comes under Shekhawati clan. The city was built as thikana in the 18th century by Bhojraj Ji Kasubsub who belonged to the Shekhawat Rajputs clan. The exotic destination in Rajasthan is famous for numerous forts, havelies and palaces.